2015 Rally application forms now available! As from 09.00 hrs Arrival and registration at Casemates Square. After registration you are free to wonder around town have a coffee or just do your own thing. There will be a most popular car competition. These will be chosen by the public visiting the Rally. Prizes 1st, 2nd and 3rd. 11.00 hrs Continuing with our theme of visiting Historical places we have this year selected a guided tour of The Gibraltar Museum. Those wishing to visit our very interesting Museum should make their way to the entrance of the Museum in Bomb House Lane. Maps will be issued at Casemates. The Museum is about 5 minutes from Casemates. 12.30 hrs All Participants should make their way back to Casemates. Miss Gibraltar will pay us a visit and ride up Main Street in one of the cars. 13.00 hrs. 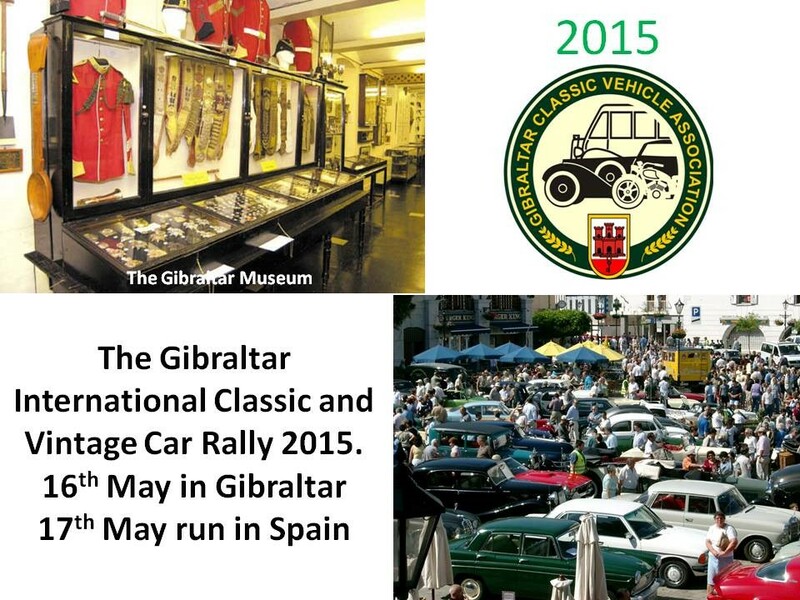 All vehicles leave Casemates and proceed up Main Street and tour round Gibraltar. Miss Gibraltar and Princesses will ride in the front open vehicles. There will be a stopover for refreshments. 15.00 hrs Lunch at a venue to be announced. After lunch you are free to depart. Vehicles departing for Spain will be given through passage to the front of the frontier queue should there be any. 10.00 hrs Departing from La Linea stadium. We can liaise with others staying in the area to pick up en route. Proceed to Sotogrande via a short selected route for breakfast and display of our vehicles. Soto Port is always a great venue for this. Those staying in Sotogrande go direct to the port. We hope that many of you will again join us on this our 14th Rally. As always we hope to provide you with an interesting and varied two days. Final programme and entry forms will be sent soon. In the meantime please put the date in your diary. We shall be contacting you again soon with costs and entry forms. Saturday Feb 7th John Macintosh Sq 10am to 3pm. Static Display. Sunday 15th Feb. Breakfast outing to Meson Sancho. Meeting La Linea Stadium to leave at 09.15. Saturday 7th March. Casemates 10am to 3pm. Static Display. Sunday 26th April Drive it Day. Clubhouse as from 09.30 for Breakfast. Maybe lunch later. More information will be sent. Saturday 2nd May. John Macintosh Sq. Pre Rally Static Display. 10am to 3pm. Saturday and Sunday 16th & 17th May Rally. Saturday 6th June Casemates 10am to 3pm Static Display. Saturday 22nd August 2 cars needed to open Gibraltar Fair. Saturday 29th August Trip to Alcala del Valle. Information on this has already been sent. Need your answers. Sunday 4th October Casemates 10am to 3pm static display. Saturday 7th November John Macintosh Sq 10am to 3pm. Thursday 19th November AGM. More information later. Saturday 5th December Casemates 09.30 to 17.00 hrs Gibraltar Small Business Day. ( To be confirmed). Saturday 12th December Christmas Dinner. More information later. There will be other outings to Ocean Village and to Spain which will be announced at a later date.